A web platform that leverages digital media, storytelling, and story-sharing to make elementary school classrooms more inclusive and empathetic. The U.S. is becoming increasingly diverse, and the world is becoming increasingly interconnected. However, K-12 classrooms rarely prepare students to understand cultures different from their own and to engage in meaningful dialogue with people who have different perspectives. Our current political climate further underscores the need for learning to foster empathy and understanding rather than polarization. First, they are encouraged to develop empathy for others by listening to stories that are typically not told in the mainstream media. Second, students get creative by crafting a story about their own hometown, culture, or community. Third, students put their empathy and storytelling skills to practice by interviewing someone in their community and retelling that person's story to their classmates. Through participating in The Story of Us, we hope that young people will develop self-awareness about their own cultural identities and respectful curiosity towards the identities of other people, the ability to communicate across cultures and to think critically about the assumptions they make. We created The Story of Us from September - December 2016 while taking the course Universal Design for Learning at the Harvard Graduate School of Education. Universal Design for Learning (UDL), an educational framework rooted in cognitive neuroscience, guides the development of flexible learning experiences that can accommodate individual learning differences. The Story of Us provides learners with multiple means of representation and perception by presenting stories about diverse peoples and cultures in text, image, audio, and video formats. Videos are captioned whenever possible, and text to speech would also be an option on the finalized version of the platform. 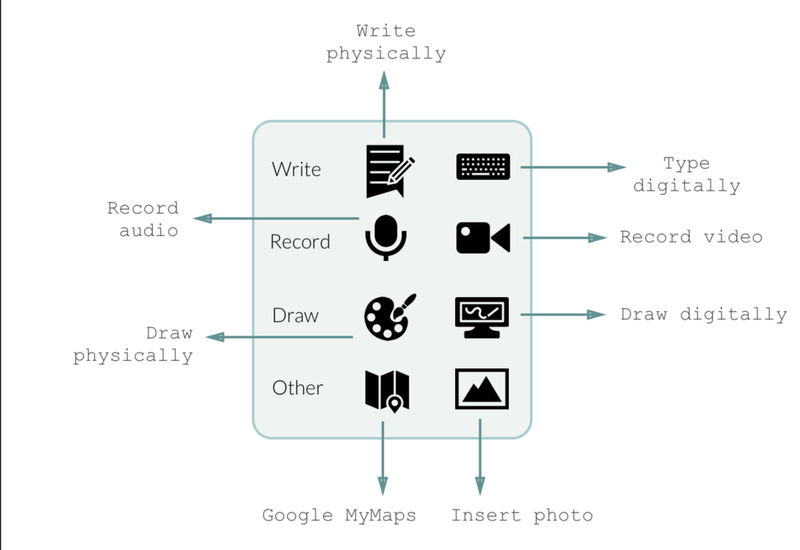 Students have a variety of tools at their disposal to express themselves: they can write or type, record audio or video, draw on paper or on their devices, insert photos, and utilize Google Maps. In addition, students are engaged in physical action in both their classrooms and communities. The Story of Us engages students by providing them with a strong sense of agency and by fostering meaningful social interactions with peers and others in their community. Social-emotional learning is at the centerpiece of The Story of Us, which research has shown to be critical for engagement. Research shows that story-sharing promotes collaborative learning, builds community, and helps teachers create a sensitive multicultural curriculum, all while helping students build language comprehension and writing skills. It can also be an effective strategy to stop bullying and antisocial behavior in schools. The Story of Us is designed for diverse learners spanning a range of backgrounds, socio-economic statuses, learning abilities, and social-emotional traits. Guided by UDL principles and drawing inspiration from Out of Eden Learn, UDIO, BetterWorldEd, and StoryCorps, our team brainstormed ideas and developed an initial draft of the curriculum. In the process of mapping out the information architecture of the platform on paper, as well as sketching what the platform might look like, I helped our team refine the curriculum by organizing it into three themes: Empathize, Express, and Engage, which were inspired from the three guidelines within Universal Design for Learning. The centerpiece of the Story of Us platform is a toolbox that allows for multiple modalities for self-expression. In designing this toolbox, I grouped the different types of tools we wanted kids to have access to into categories. I then sketched icons to represent each tool as well as ideas for how kids could interact with each tool. Next, I created high-fidelity mockups and built an initial prototype for the platform, for which our team received feedback on during a public expo. Based on the feedback we received from the expo, I iterated the mockups and built a new prototype. Media content within the Story of Us prototype is attributed to UDIO , Out of Eden Learn, BetterWorldEd, and Upworthy. The image on the homepage was taken by Slava Bowman, and icons in the prototype are attributed to The Noun Project. Icons on this page were modified from designs by Popcorn Arts. For a full list of references, please see the research report.